Either you’re hiking with a friend/boyfriend/girlfriend/spouse or you finally lost the title of ‘pink-blazer’ and bagged you a broad, hiking with someone else does have advantages. 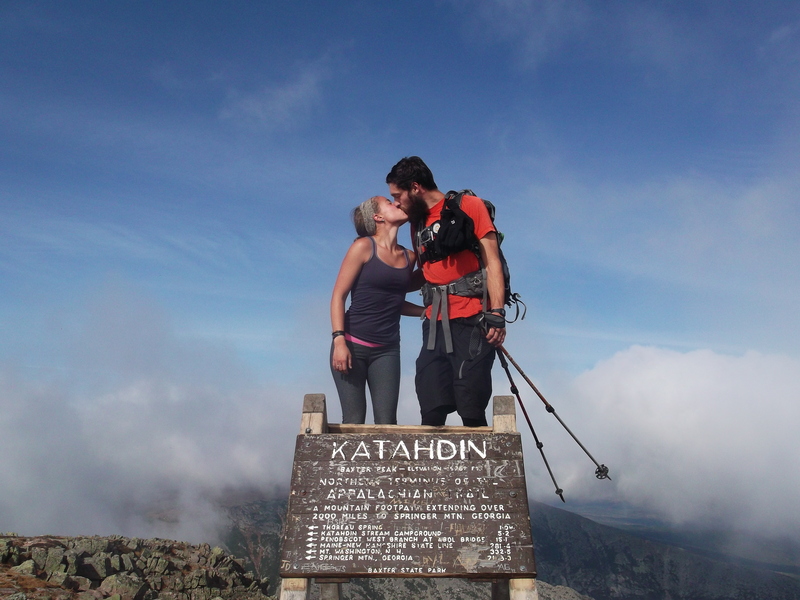 I left for the trail with my boyfriend and I summited Katahdin with him too (to the surprise of many bitter love haters we met along the way). Hiking with a partner is interesting both emotionally and psychologically. But, those two characteristics aren’t my expertise so let’s move on to GEAR! The best characteristic about having a partner is sharing gear. Tent, water filtration system, stove, and first aid – only one for the both of you is needed. Dividing the gear between two packs might take some time to figure the best fit. Every couple devises their own system of doing this. I still recommend you both keep your own guidebooks just in case you both have the urge to navigate but this is based on preference. I barely looked at the guidebook on my thru-hike but I liked it that way. When it comes to couples, eating out of the same pot might not be feasible. Seriously, I probably wouldn’t have had a proper dinner portion if this was the case or we both would have fought over it like hungry dogs. I recommend carrying one bowl, plastic cup, Frisbee, whatever for the other person to eat out of. I know purchasing a whole new shelter might not always be feasible for those partners who meet on the trail. I have seen these couples both stay in a one person tent; all depends on preference, budget, and the space in that one person tent. 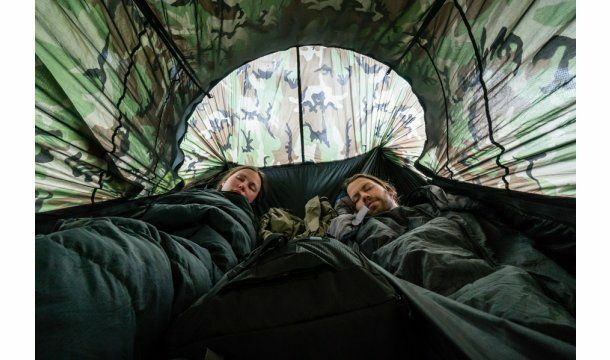 This link to, Outdoor Gear Lab, has reviewed and compared 26 different two person tents if you and your partner are in need of some assistance choosing the perfect shelter. This idea is a bit interesting. I have not seen this on the trail in 2013 but I am very intrigued by the idea. Why should hammocks strictly be for solo hikers? Looks like a gear review is in order… Anyone have experience with a double hammock? Not really a gear tip but a great tip for partners all the same! Setting up camp with a partner is great. One person sets up the tent and hangs the bear bag while the other cooks dinner and gathers water. Those precious minutes you save not doing all the chores allows you to get in bed even sooner! When I say this, I am talking to the ladies. My man will not refuse extra weight but that doesn’t mean he should carry it. Men will naturally be able to carry more weight. However, do not carry a 15 pound pack when your partner is pushing 50 pounds. Also, if your partner can’t carry as much weight as you would like, time for a shakedown! If you are a smart hiker (which I know you are! ), your pack weight should be nothing to complain about it. If it is, check out THIS LINK for some helpful tips on the perfect backpack. Some sleeping bags are compatible to zip together, if you are in to snuggling with your stinky counterpart. One must be a right zip and the other must be a left zip. This is not the case for all models of sleeping bags so always make sure before purchasing if this is your end game. Therm-A-Rest has developed a way to keep you and your honey’s sleeping pads together with a coupling strap. Yes, sleeping pads seem to drift apart in the night. I only see this being a problem if you and your partner are using Tip #7. The Coupler Kit isn’t restricted to just this size sleeping pad. If you are thru-hiking with a partner, you get to know that partner really well. For instance, my partner would get very grumpy when hungry. Once you notice your partner’s mood change, have a stash of snacks close by (like a hip belt or side pocket), to immediately extinguish his or her route to grumpy town. If your partner is like mine, he will refuse to stop to dip into the snack bag and his hunger will take over his rational thinking. No fear, handy snack is here! 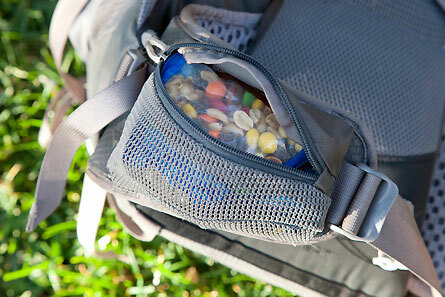 This tip should not be left only for the couples; solo hikers can get in on handy snacks too! I can’t believe I am going to post this tip but wet wipes should be included in a couple’s pack list. It must be said. If you and your partner, ya know, have urges then wet wipes come in handy. That’s it, that’s all I’m going to say about wet wipes.